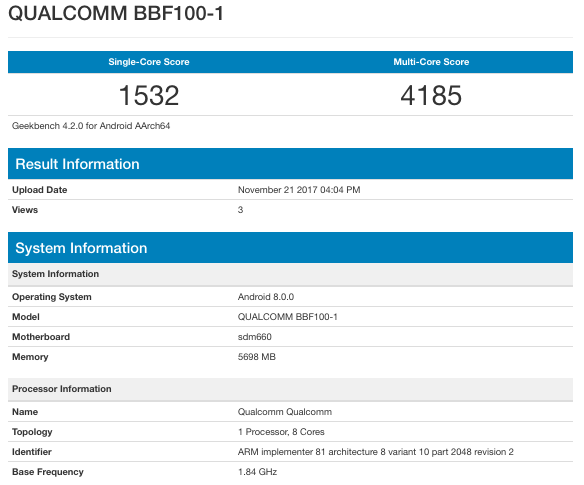 Today, a new entry appeared in the popular benchmarking app – GeekBench. The name of the device in question is “QUALCOMM BBF100-1”. As a reference, the BlackBerry Motion model number is BBD-100-X while the BlackBerry KEYone carried a model number of BBB100-X where X is a number depending on the region. Given the timing of this report, we might be able to speculate that this is the successor to the BlackBerry KEYone. Last year, a prototype of the (then called) BlackBerry Mercury was shown off to the press, who received the device very well despite the fact that we were only shown the device’s hardware. Anyway, the unnamed BlackBerry device yielded pretty good scores with a Qualcomm Snapdragon 660 CPU paired with 6GB of RAM. This is all that was revealed by the newly uncovered GeekBench results. The BlackBerry KEYone did pretty well and we are very much looking forward to seeing how Blackberry and TCL will collaborate for the “KEYtwo”. As per our previous report, last month - this unreleased BlackBerry will feature a display resolution of 1620 x 1080 px and will most definitely have a QWERTY keyboard. There is no device like BBZ10. Please re-launch the BB Z10 in android. Still I am in love with that device. How could the successor be clocked at 1.8ghz?